Enjoy hotel pickup or make your own way to 301 Martin Luther King Blvd - Savannah Visitors Center to board the sprinter convertible(choose at time of booking). Sit back and relax on the full 1.5-hour loop through the Savannah Historic District, the Victorian District, River Street and Savannah City Market. As you drive through the town's stately mansions and hanging Spanish moss, experience the magic that was the inspiration for John Berendt's novel 'Midnight in the Garden of Good and Evil'. Learn the history, legend and lore which has shaped Savannah into a place known both as one of the most romantic and most haunted cities in America. At the conclusion of the tour, make your way to River Street to board the Savannah River Queen. 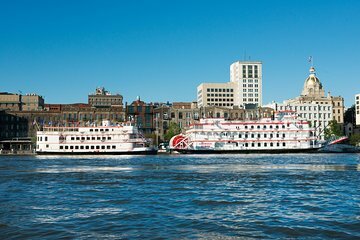 Take in the waterfront views as you cruise along the lovely Savannah River and learn about the history of the river from your captain. The tour was relaxing, informative, and entertaining all in one. Dennis was a non-stop source of information and above and beyond to make sure all our needs we're covered and our concerns were put at rest. If you only have a in day in Savannah this the way to go, if you're there more than a day do this the first day and you'll know where you want to spend more time. We had a wonderful time on this dolphin tour. We saw more than the average dolphins on our tour. We feel very safe with Captain Mike and his second mate. We would definitely go again. They were on time and very friendly. The land and sea tour was great. Nice visitors center. A lot of good information for tourists.Love Savannah and Tybee island. Nice people. It's August in Savannah, so the heat is on and the humidity is up. We have an afternoon to kill and are in the mood for a tour around the historic district. This is probably the best option available. We were picked up in an air-conditioned van with padded seats out in front of the inn where we were staying. No need to drive or walk to the visitors center to meet the tour. Already, it's step up. It turns out, the van is the vehicle in which we will take the tour, rather than a hot trolley with hard benches for seats. Another step up. Then, as it turns out, the driver is also our guide and he absolutely knows the historic district, the buildings, the architects, the squares, all of it. For anyone visiting Savannah for the first time, THIS is the way to go. You'll drive through side streets and neighborhoods in the historic district that you would likely miss on your own. You'll get a lot of background to orient you to the history, and you'll have a chance to make a lot of mental notes regarding mansions and museums that you'll want to return to later for a tour inside. Then, it gets even better. Our guide took us down to the river front where we had lunch before round two action - a river cruise on the paddle wheeler. That is a lot of touring for the money, and two different experiences combined into one package. The whole thing took the entire afternoon with the downtime for lunch in between, but, hey, this is Savannah. You're supposed to be out making the most of your time in the city, seeing the sights, exploring, eating and drinking stuff, then back out again for more of the same. You really need to do two things - find a place to stay in the historic district, and take this tour combo. My husband and I visited Savannah for a long weekend trip. Enjoyed the riverboat tour and the shuttle tour. Stephanie was knowledgeable of the area and did a great job of taking us over the city and pointing out the points of interest. Plan to visit again!! The weather was a bit hot. This was a great choice. We learned a lot as we were on the Savannah River. It was beautiful! And we even got to see a huge container ship pass by us and the speaker did a great job explaining everything about the ship to us! A must do!!! Tour Guide very knowledgeable ! This would have received a higher rating if we would have been returned to our starting point at end of sea tour. The instructions provided by land driver were incorrect and we ended up getting off the wrong bus and walking 15 blocks into a 20 mph wind. There should have been a service included to return us to our vehicle. Very disappointing. We enjoyed everything about Savannah, and had a great time on the River Cruise. We weren't sure if it was going to be a kid friendly city for our two young boys, ages 10 and 7, but they loved the history, the pirate stories visit the Pirate House! and the ghost tales. Highly recommended! It was a very interesting and informational tour and fun on the boat! Pleanty of room for everyone! The trolley tour was awesome! The driver was very knowledgeable and friendly and took us all over town!